Most people, and most professionals in particular, know what they should do. It is the stuff of aspirational New Year’s Resolutions and Twelve Step Plans. Yet even those readily acknowledged “right principles” often fall to the wayside of neglect and outright avoidance. The mind and heart acknowledge and are willing, but the follow through falters. Nowhere is this more true for the world of design and construction professionals than in the arena of written/unwritten contracts. 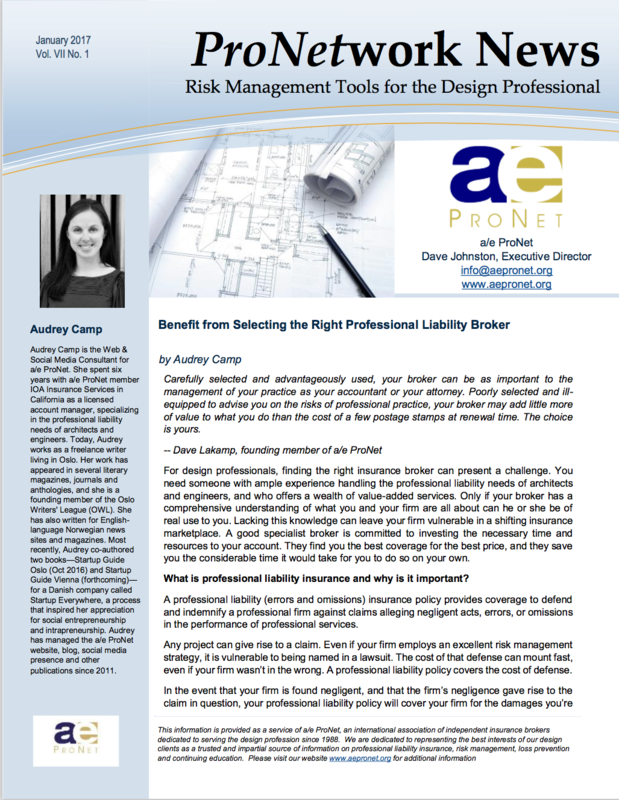 Professional liability insurance is a necessary business expense. The professional liability policy provides the design professional with a sense of financial security against errors and omissions. The policy also provides project owners and contractors with a level of comfort that a “deep pocket” will be available for any additional project costs caused by professional negligence. 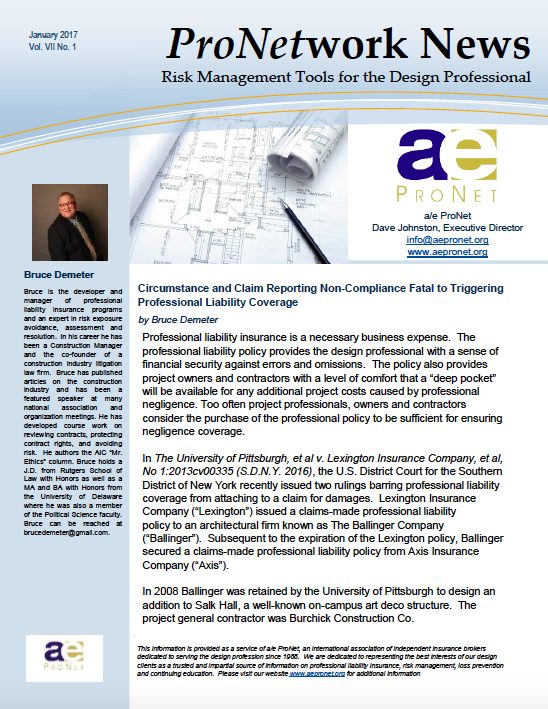 Too often project professionals, owners and contractors consider the purchase of the professional policy to be sufficient for ensuring negligence coverage. 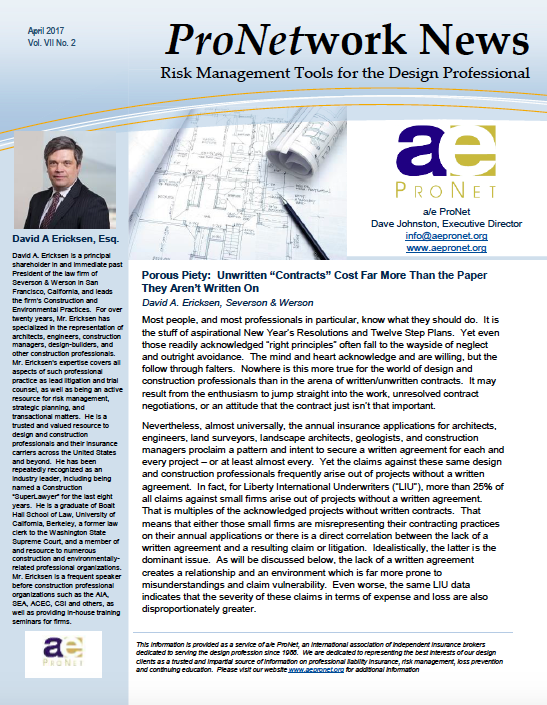 Continued from the August 2016 issue of ProNetwork News including an analysis of Beacon Residential Community Association v. Skidmore, Owings & Merrill LLP, et al. and its impact on future court decisions. This newsletter includes the following important contract provisions: Indemnity, Waiver of Consequential Damages, Limitation of Liability, No Third-Party Beneficiaries, The Certification of Merit, and Provisions Requiring the Developer and Subsequent Owners to Include Maintenance Requirements and Manuals in CC&Rs and Purchase Agreements. Do architects owe a “duty of care” to the homeowners of a condominium project with whom the architects have no contractual privity? According to the California Supreme Court, they do. What does this mean in practical terms? 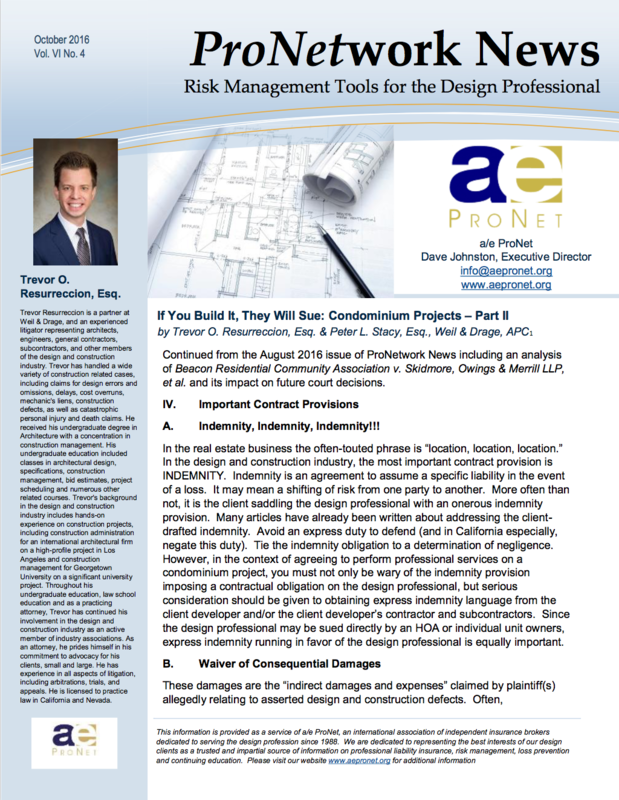 The answer is that architects are now more than ever exposed to potential future claims and lawsuits brought by homeowners and the homeowners’ associations years after the project has been completed even where the architect’s design decisions are trumped by those of the project developer, and the architect’s role in the construction phase of the project is limited.